BadCatDesigns: The BadCat January update! So today I have a little of this and a lot of that! I thought I would share a few of the goodies I amassed this holiday season. I also thought I would give an update about the goings-on on my needles. Engeln Spitzenstricken: Individual Engeln patterns found by selecting the English-speaking flag on the top right and looking at the lace patterns. Kunststricken Grobe und Kleine can be found as above, but selecting the lace books! The next fine stuff I have to show you came from Colourmart. What can I say? My order arrived in 6 days from the time I placed it and the yarn is perfect. 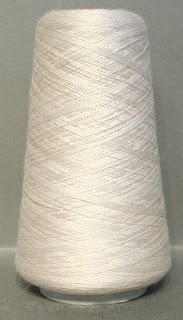 It is hard to get really lovely fibers in very fine weights, so this is a special source for me. Don’t drool on your keyboard. 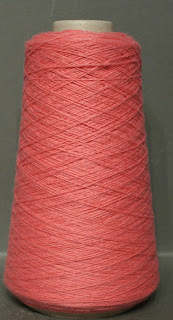 This is 2/28 cashmere/merino in the Candy color. 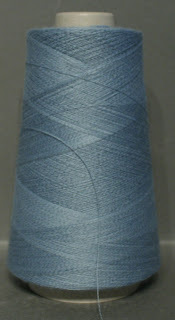 I also got some 2/28 lambswool/silk in the stone color, but I didn't have a picture to show you. You can imagine... Each of these cones is 100 grams and between 2000 and 3000 yards, which is enough for any of the large designs in any of the books and patterns you saw above. So many fine choices! I feel like a kid in a candy store. Is this not mouth watering? 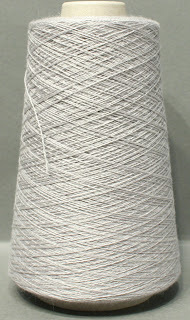 This lace-weight yarn is not as skinny as the yarns I got from Colourmart, but it is a true lace-weight yarn in the softest lamb’s wool. It has lots of give and blocks wonderfully, so this is another special source for me. My recent Sampler Stole was knit with this yarn and is lovely. You can see all the new Lacey Lamb colors on the Jade Sapphire website. ENJOY! I have finished the central panel and I am over half-way done with the deep border, which is running down the lower edge. After that, there are just the two side edges and it will be done. Expect to see it again February! This is an old French doily pattern, and I couldn't resist the pears. I am three-quarters of the way through the pattern, and the only modifications I have made are to the double-decreases. I have made some of them directional, where they were originally written as all the same decrease. Once the actually pattern is done, the piece will be too small to be something to wear, so I was thinking of adding to it to get a larger (shawl) piece. It also occurred to me to make sleeves for it…to be continued! I was gifted with this award this week, from Fleegle, and I am so honored! It seems I must pass it along to ten blogs that make me happy, but here is the rub. I am a bit clueless… I read a small handful of blogs and those blogs have already been honored. I have six blogs I already selected to pass the award onto, but I need four more. Please be kind and leave me suggestions! My next post will pass the torch! Until then, knit-on. 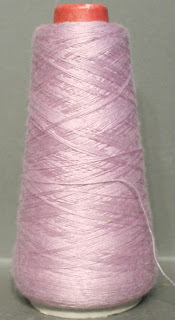 Do you read yarnstorm.blogs.com? Jane who writes it regularly makes my day! Ha! My keyboard is drool-proof. It actually has a drainhole! It's Panasonic ToughBook, and boy, I sure needed that drainhole, looking at both your kntting and your acquisitions. Bet you are in a quandary trying to decide what to do first! Thanks for the brilliant suggestion. I went over to Jane's blog, had a good look, and I am with you. Now I only need three more! You know I am in that quandary, and you always make me laugh! I can't send the award back to you, can I? Hey girl, you got you some mighty sweet stuff there! I love it all! We seem to have the same taste in ColourMart yarns too as several of your new cones are on my lust list right this minute (gotta wait until after the 1st). Thanks for sharing your doily pattern. It's the sweetest thing. I think I may just give it a whirl as my 1st knitted lace doily--to go with the tatted and crochet ones I did in the past. So many great lace projects to knit...so little time! I'm have a yarn induced heart attack looking at this screen! I had just said I was going to try to knit from my stash this year and now I'm having second, third and fourth thoughs about it looking at all your beautiful stash and pattern enhancement. It is to die for. Love it!